The Default view of the gallery is Albums, the first of which is always the Camera album, which has a camera overlay icon too. Unfortunately, there's no support for online albums. You can view photos in a rectangular grid, which is horizontally scrollable. An alternative to the grid view is filmstrip view, which is more suitable for landscape viewing as it shows bigger thumbnails. A nice feature here is that thumbnails for video files are animated, although it takes a while for them to get started. There's a built-in editor that covers the basics - cropping, rotation and flipping, sharpening - but you can get into the more advanced stuff too, like beauty tools (e.g. change skin complexion), image controls, effects, frames, text labels and bokeh effects for simulating depth of field. The Gallery app also features a collage tool that can combine up to 9 photos, with a variety of preset collage arrangements and borders. Movie Studio is also on board so you can edit videos as well as photos. To make a video, just create a new project, add videos or photos to the timeline, add music too. Videos can be trimmed if they run too long and you can add text titles, transitions and effects. The video player has a simple interface - sans the animated thumbnails from the gallery. You can adjust how the video fits on the screen, but there is no subtitle support. Codec support is reasonably good, supporting all major codecs including MOV files - a bit of a rarity with Android devices. The audio codec support was no match however, and there was no sound on videos that use AC3, Dolby Digital or DTS (which are the codecs of choice for multichannel audio). You can share videos wirelessly with Wi-Fi Direct right from the video player. While the video player was a bit of a letdown, the music player makes up for it with a full list of features. It has a tabbed interface that sorts music by artist, album, lists all songs or shows the playlists. The Now playing interface is custom and shows a giant vinyl record when there's no album art available. There are basic features like scrubbing through a song, activating repeat and shuffle (including Part shuffle that just mixes your whole library). There's a capable equalizer that lets you make adjustments, although some require a plugged-in headset. While you're playing a song, the lockscreen will display a full-frame shot of the album art alongside simple playback controls. The notification area also lets you control the playback via an expandable notification. The FM Radio is a pretty straightforward affair. You need to plug in a pair of headphones (to act as an antenna), the app will start playing. Sound can be played through the headset or the loudspeaker. RDS is available and you can even record broadcasts (this feature might not be universally available). 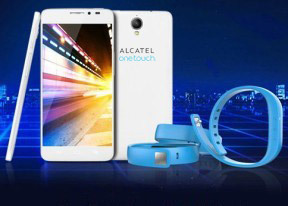 The Alcatel One Touch Idol X+'s audio quality is a tale of two chapters. When attached to an active external amplifier, the smartphone delivers impressively loud audio with good frequency response, excellent dynamic range and no distortion. Certainly one of the best performance in this scenario. However, just like with the One Touch Hero before it, the Idol X+ lost quite a lot of its brilliance when we plugged in a pair of headphones. Volume levels dropped quite a lot - from excellent to average, while stereo crosstalk and intermodulation distortion spiked. 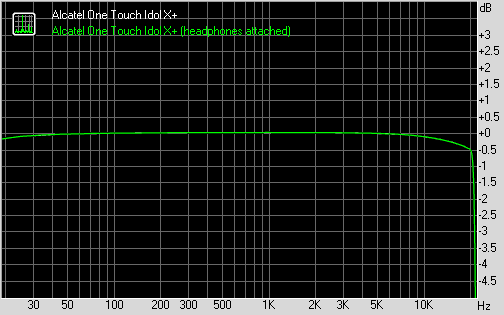 Less demanding users might be fine with this performance, but audiophiles should take their business elsewhere. And here go the results so you can see for yourselves.